This #TransformationTuesday we’re bringing the magic to Upstate South Carolina. If ever you need a reminder not to fight an oil fire with water, take it from this kitchen. While throwing water on a flame is usually a good move, using water to try to stifle a grease fire can cause devastating effects, as this family recently found out. Luckily, this kitchen wasn’t too badly damaged by the time we got there and we were able to successfully restore this family’s walls, cabinets, and ceiling. What could start out as a small flame can quickly turn into an inferno when you pour water over oil based fire. Because grease fires are remarkably hot, the water vaporizes into steam on contact and expands, sending the oil in all different directions rather than quenching it. Instead of going out the fire swells drastically and could easily catch the rest of your kitchen and house on fire. So unless you want to create a giant fireball, we recommend you try suffocating the grease fire instead. 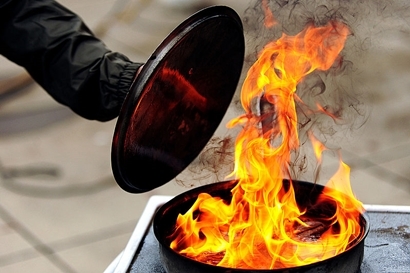 You can cut off a fire’s air supply by simply placing a lid, baking sheet, or another pot or pan on top of the flame. If that doesn’t work or it’s too large of an area to cover you can also dump baking soda on top of it. A lot of baking soda. Just pile it on. The baking soda creates carbon dioxide which cancels out the oxygen, effectively stifling the fire. Fire damage can be a hassle to take care of between the tell-tale burn marks and lingering smell of smoke. Leave it to the professionals and let 911 Restoration transform your home and give you a Fresh Start. Check out how we restored this kitchen to it’s former glory in the video above, and check out our other #TransformationTuesday projects on our Facebook Page.